Thinking we had a lot of driving today, we got up, got an early breakfast, and prepared to leave the Metropolitan Hotel in Reykjavík. The skies were nearly cloudless this morning and we kind of wished it was like this yesterday when we were at Gullfoss. As we were settling the balance, we engaged in a brief but friendly conversation with the receptionist, who gave us pointers on where to find fiskibollur (fish cakes) as well as some talk about the rúntur (the unadulterated pub crawl in Reykjavik) and the tradition of eating hákarl (rotten shark) washed down with brennevin. 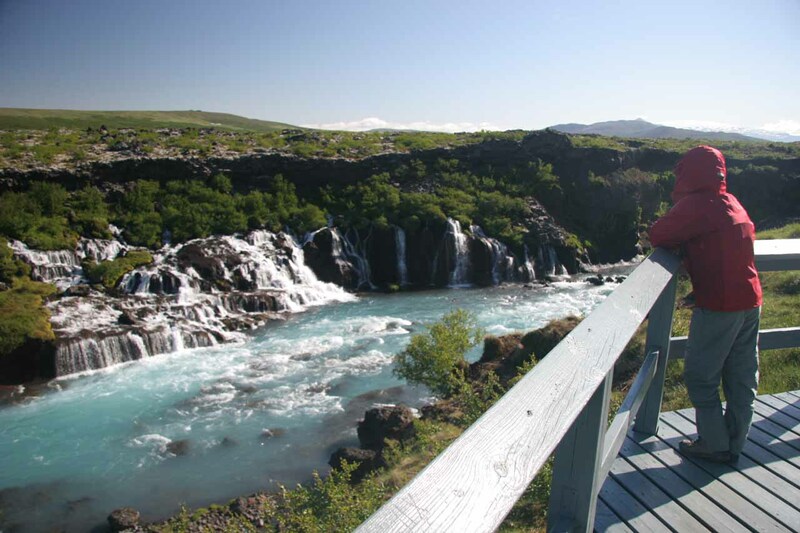 It was 6:30am when we finally left town for the waterfalls Hraunfossar and Barnafoss. This time, we went through the tunnel that passed under the Hvalfjörður, which reminded us of driving through the many tunnels in Norway nearly two years ago. We were greeted with nearly cloudless skies and an empty car park when we got there at 8am. 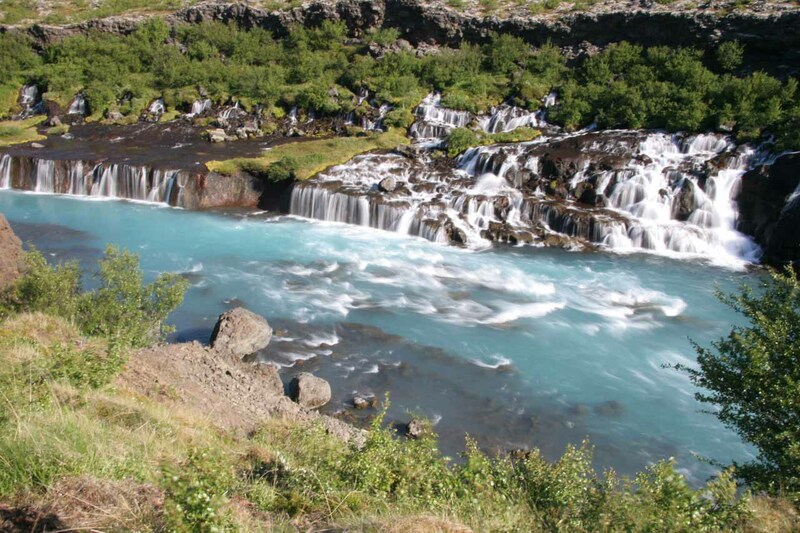 The bright sun made the glacial Hvítá River a milky turquoise color. 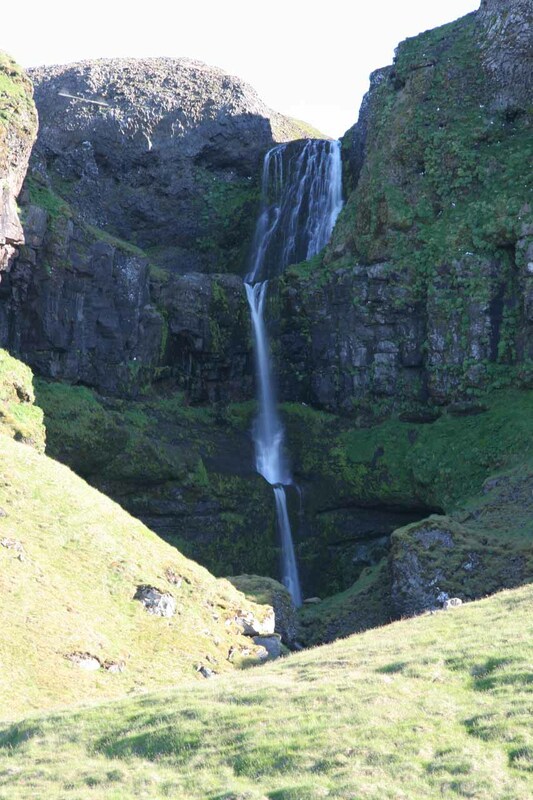 We first went to the children’s waterfall Barnafoss. This was the falls that once had a natural bridge over its rushing rapids, but a pair of kids apparently fell into the river at the bridge while the parents were at mass in town. I thought this waterfall was more like rapids than a legitimate waterfall so it would’ve been cool had that natural bridge been there. I know there was a saga that said the mother of the kids that fell into the river used a spell to destroy it. 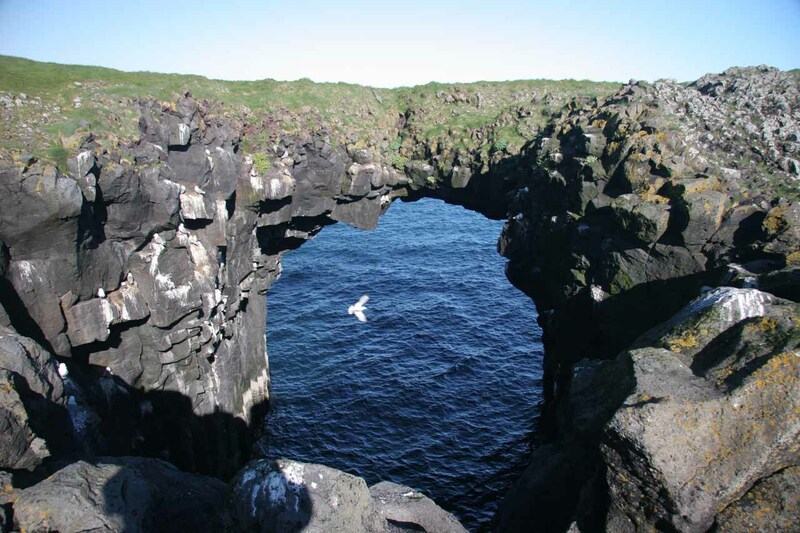 But perhaps it was really more like natural erosion that did the natural bridge in, though I had no idea when that event might have taken place (unless the saga contained some truth in there about the time). We tried to use the morning shadows to get decent views of the falls since the sun was shining directly into our view. 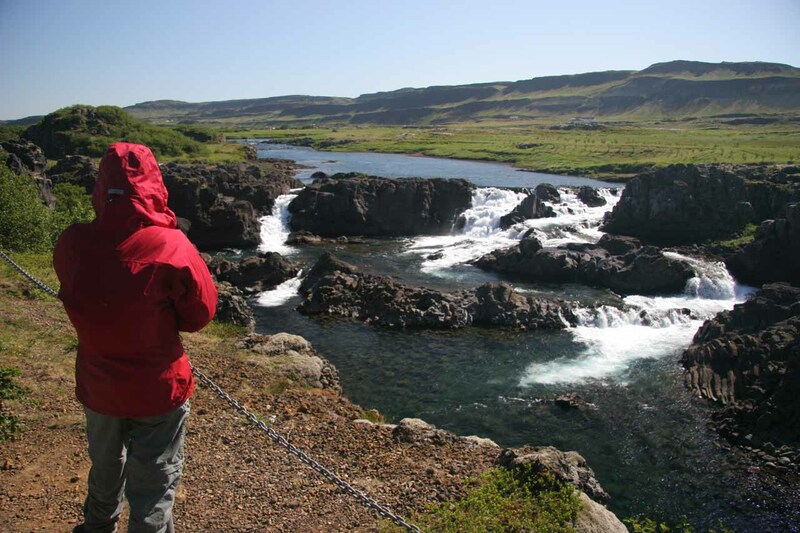 Then, we spent a good deal of time trying to photograph Hraunfossar in a variety of ways. This waterfall was really a long line of smaller waterfalls coming right out of the vegetated lava walls and grooving their way between uneven gaps in the texture of the walls. The falls translated as the “lava falls” probably because of the geology responsible for the falls. Given the long length of the falls, it was very difficult to try to capture the scene in a photograph. It was a good thing that Julie’s point-and-shoot camera had the ability to capture the scene in a movie, though. Plus, with the sun out, the river flowing right before the percolating waterfall exhibited that powder blue color that really made this waterfall stand out scenically. It got a little windy while we were chilling out at Hraunfossar, but eventually we had our fill of this scenic place and we were back in the car at 9am. We continued onwards and drove back towards the Ring Road before we went into a lava field that had some striking formations. Just beyond this lava field was the car park for Glanni, which we got to in about an hour. At first, we weren’t sure if we were in the right spot because it looked like a place for golfers rather than waterfallers, but we eventually walked down a short trail and got to a decent view of the segmented waterfall. 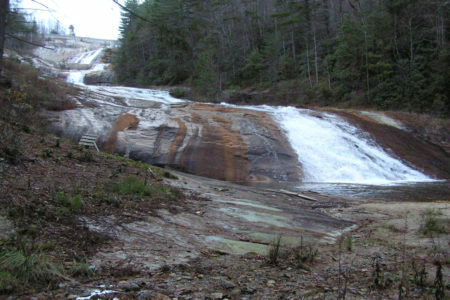 Glanni was more of a series of waterfalls that were both tiered and segmented. The vantage point we got from the end of the trail was more of a top down view to appreciate this characteristic. However, from what we could tell, there weren’t other trails that would’ve gotten us closer. 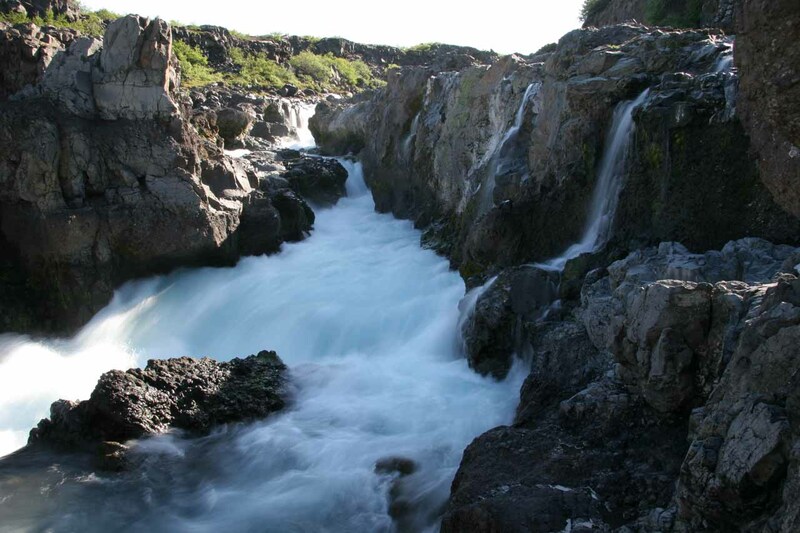 So we walked back to the car, and started to head for the Snæfellsnes Peninsula, which was where we planned to find more waterfalls as well as stay for the night at Ólafsvík. We started driving again at 10:30am. 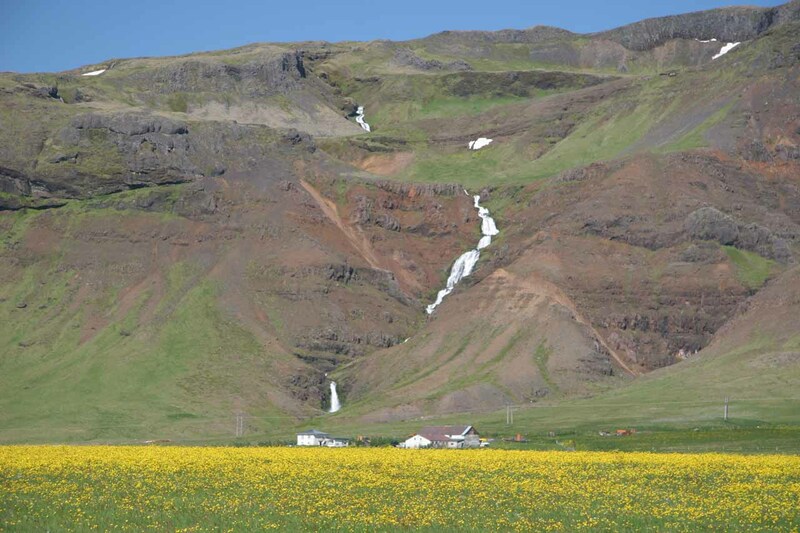 As we were on the southern end of the Snæfellsnes Peninsula, we started to encounter some unexpected waterfalls as well as fields of blooming wildflowers against deep green grassy fields on the mostly treeless Icelandic mountains making up the interior of the peninsula. 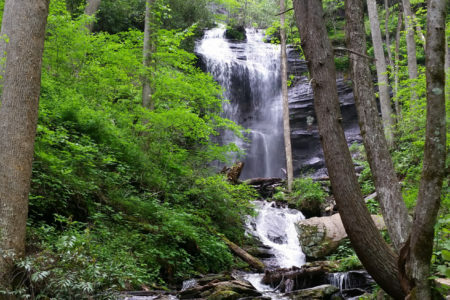 Who knew if some of these waterfalls had names. Some looked legit while others looked like they were more under the category of temporary seasonal waterfalls. I guess it goes to show you just how jaded you can become when you see enough waterfalls to start turning down photo ops for them. 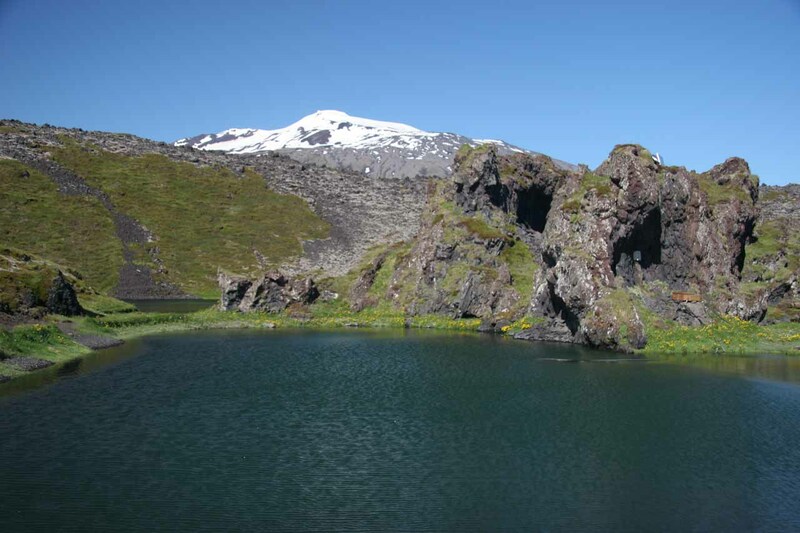 I recalled there was a place near the Veiðistaðir Pools, which was on private property, not too far west of Borganes. 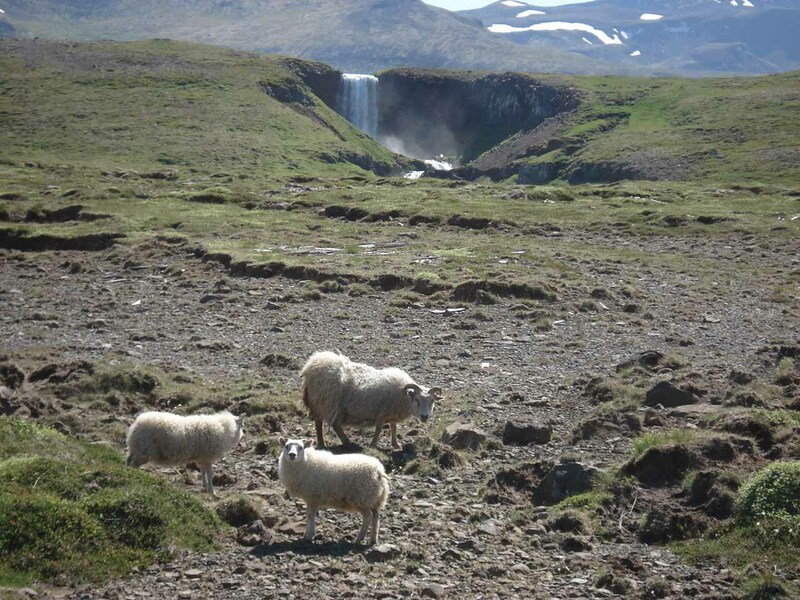 We then continued onwards towards Bjarnafoss. There were still more temporary waterfalls and by this point, we simply couldn’t stop for each one of them as we would’ve been doing this drive forever if that had been the case. 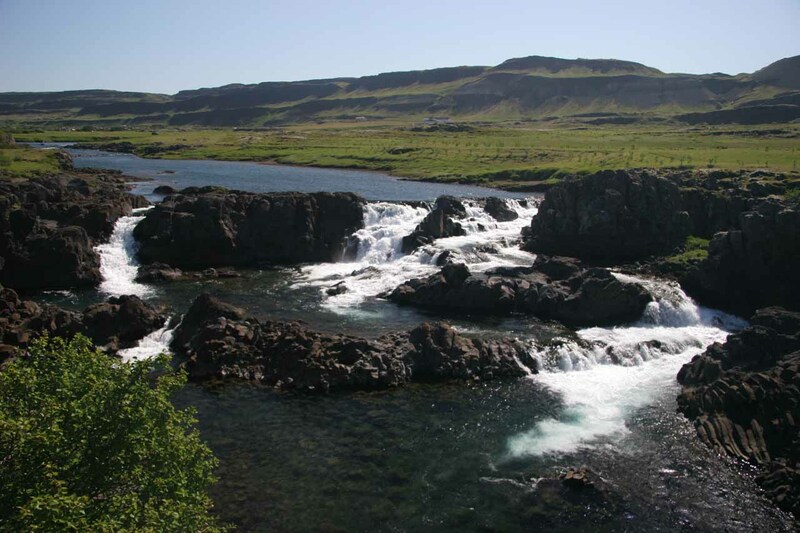 Eventually at 12:30pm, we saw the beautiful Bjarnafoss sitting right behind the small farming hamlet of Buðir. 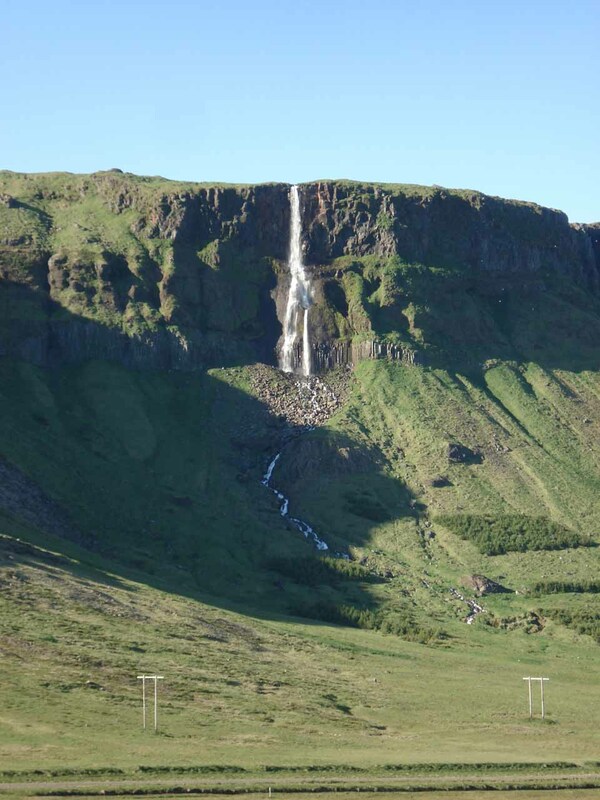 With the deep blue skies behind the volcanic mountains and cliffs pierced by the waterfall, we spent about a half hour at the bottom of the falls near a private-looking home with a large car park. 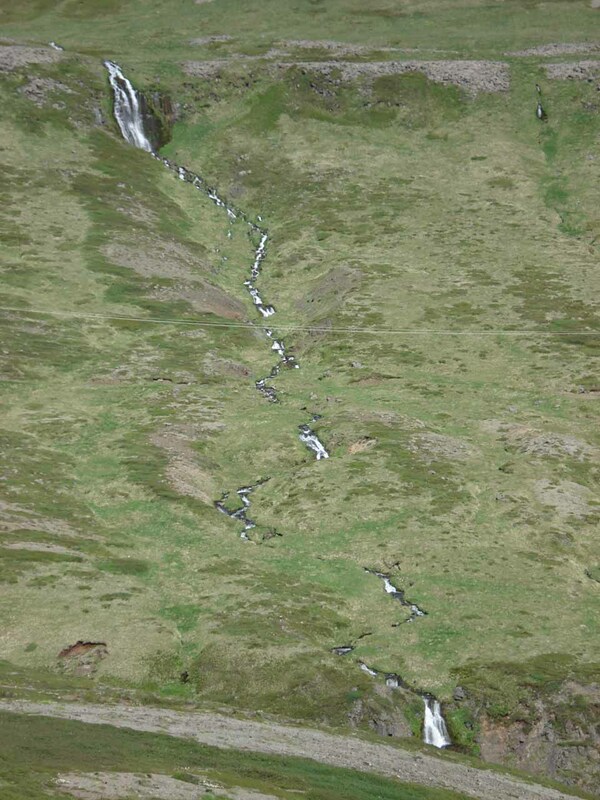 Bjarnafoss was a rather tall and conspicuous waterfall. 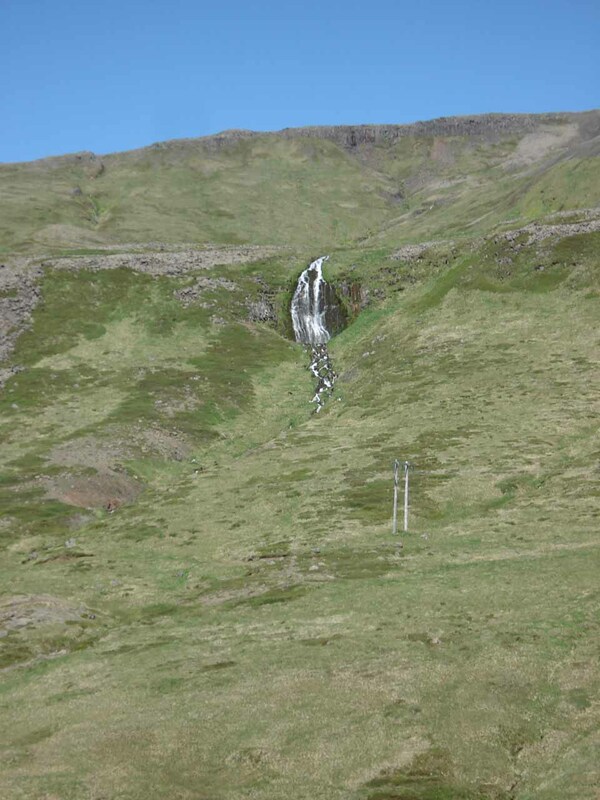 It looked like there was some unusual geology giving rise to the sheer cliff from which Bjarnafoss got its main plunge from. 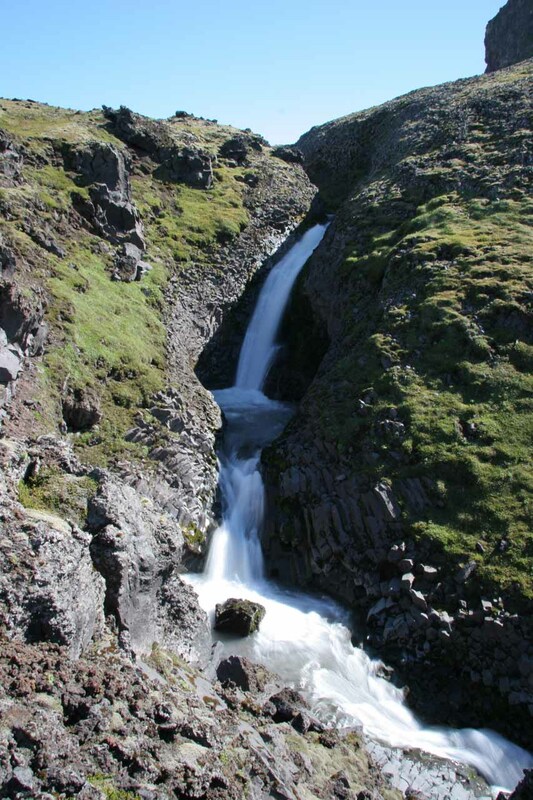 But as for the waterfall itself, it was very attractive and out in the open so it was easily visible. 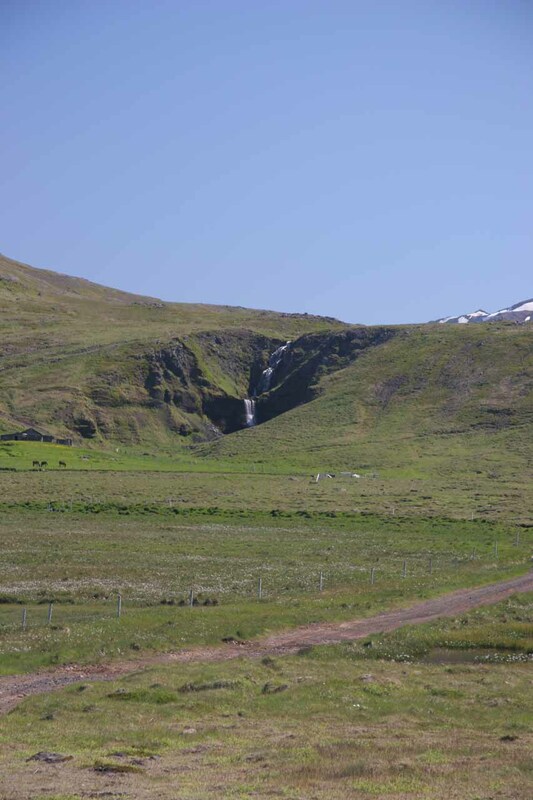 We made a brief stop here to try to somehow capture and convey the impressively tall plunging waterfall behind the farm we were stopped close to. Even a waterfall as pretty as this seemed to be a dime a dozen, and we couldn’t even find signage or anything else devoted to this waterfall. 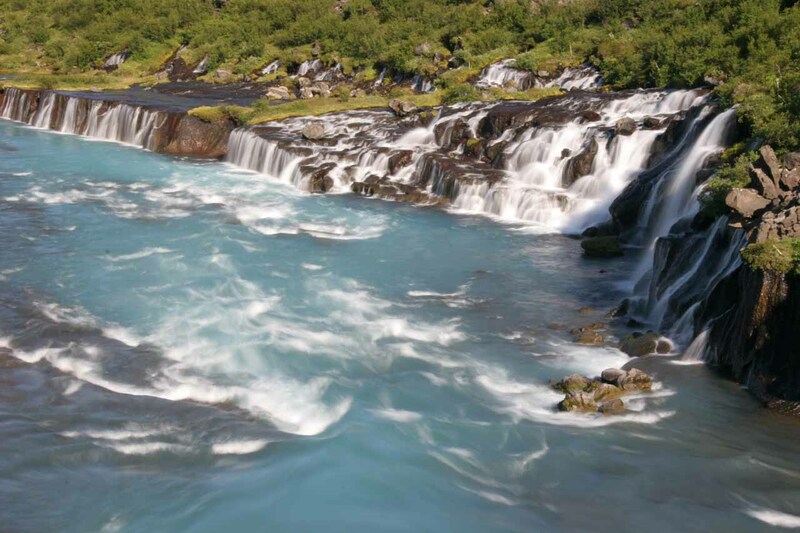 Bjarnafoss would be the last of the waterfalls seen for most of the southern part of the peninsula. 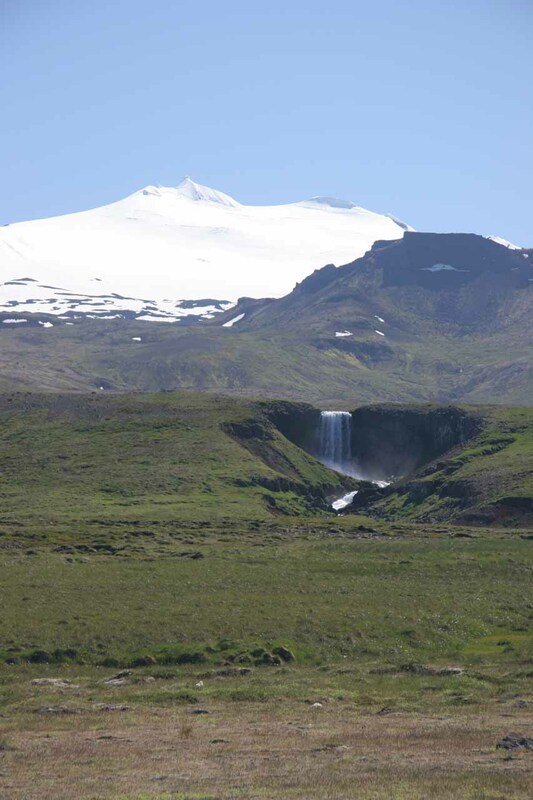 Next, we took a road through the peninsula behind the Snæfellsjökull. As the road was climbing, we noticed a handful of small ephemeral-type waterfalls though they really weren’t anything worth stopping for. 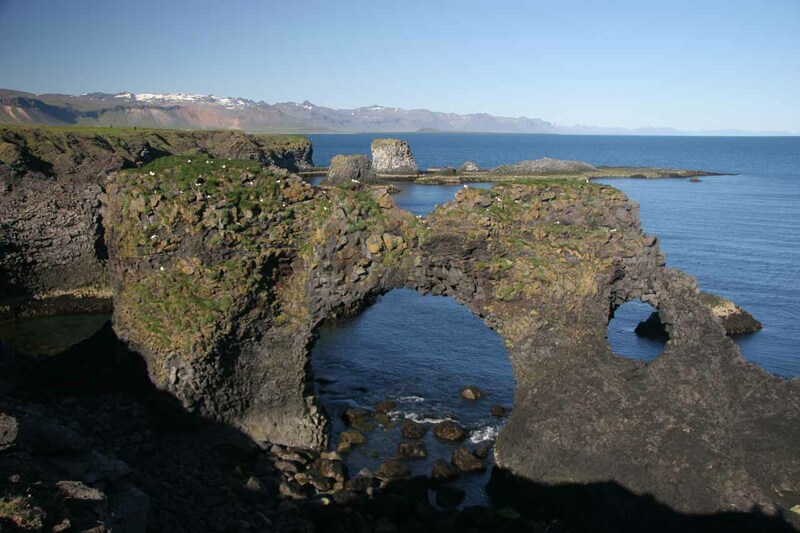 As the road was climbing, we had an opportunity to look back at the scenery of the southern Snæfellsnes Peninsula. Against the blue skies, the scenery was pretty though it turned out a little flat in the photos. 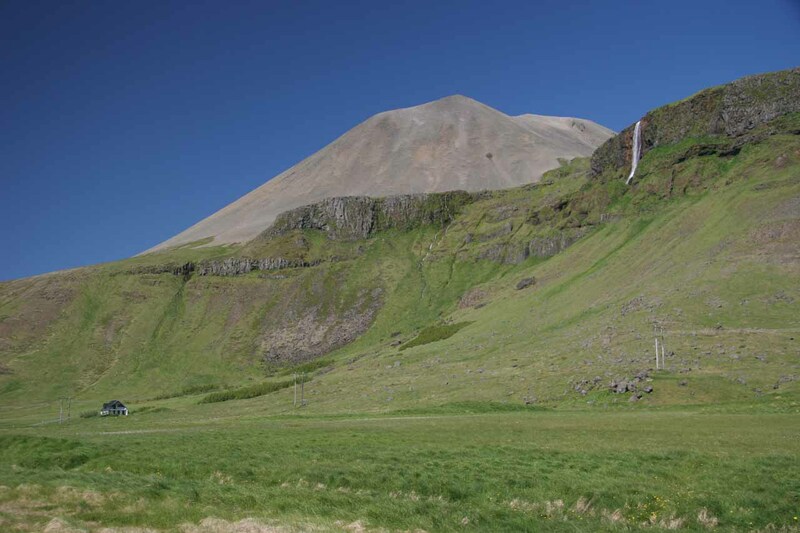 Next, we drove up through a pass before descending down into the northern side of the Snæfellsnes Peninsula. 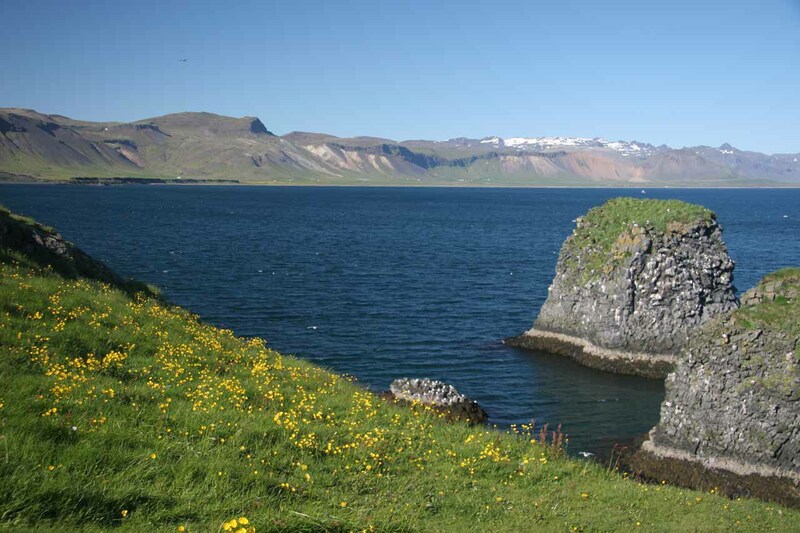 By 1:15pm, we arrived at Ólafsvík, which was several hours before when I thought we’d be here. 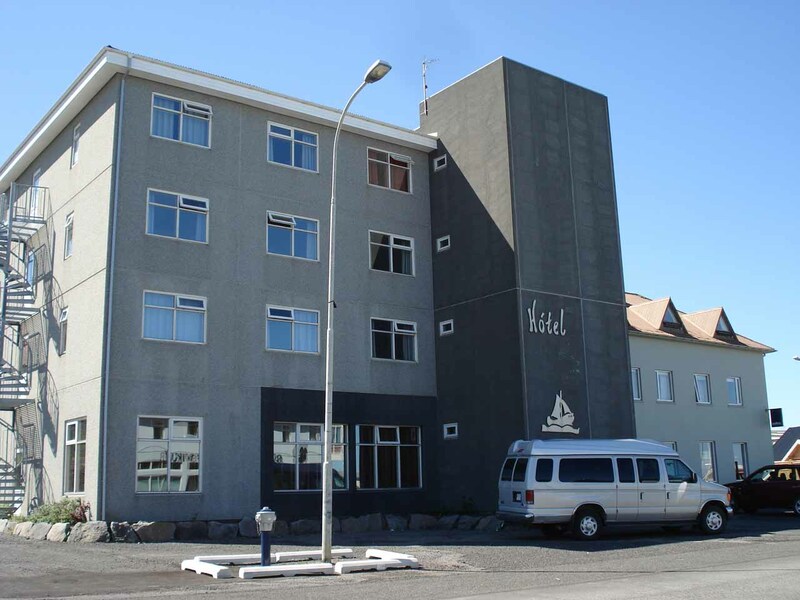 In any case, we were able to check into the Hotel Ólafsvík with their basic but adequate rooms with shared bathrooms. With the cost being well under 50% of a night in Reykjavík, we were a little relieved in the wallet. 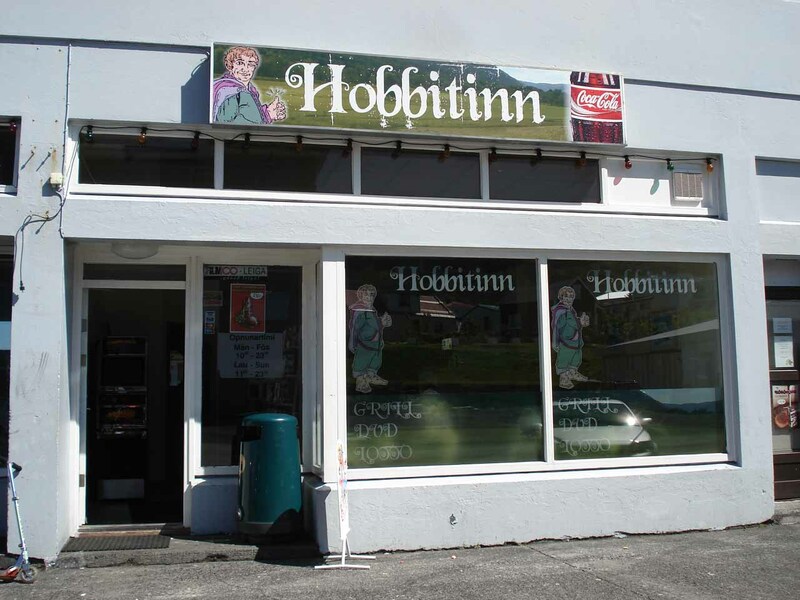 For lunch, we decided to have some hot dogs from a place across the street before deciding to drive around the western tip of the Snæfellsnes Peninsula. By about 2:15pm, we were back on the road. 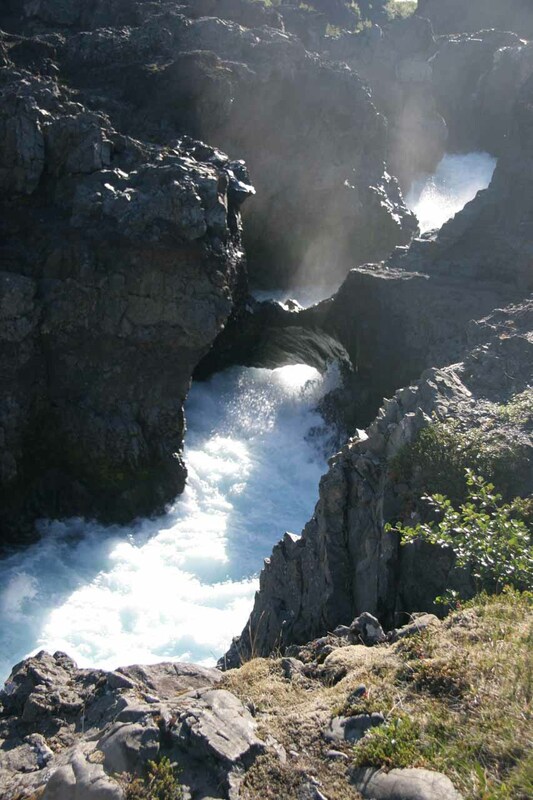 Before we were able to make some serious progress going around the peninsula, we were already distracted by a pair of waterfalls that appeared to go further inland but were somewhat visible from the road 574. 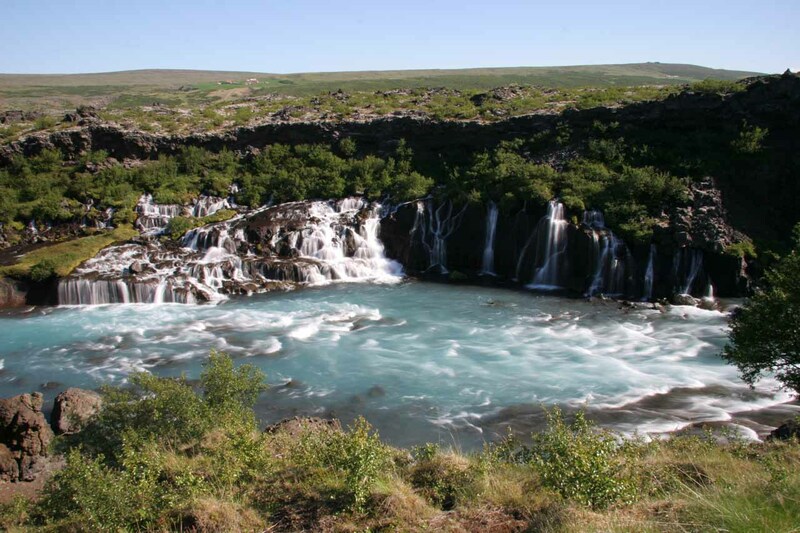 First up was a waterfall in the distance that appeared to be Kerlingarfoss. When we left the road 574 to find a rural road getting us closer, we weren’t sure at first whether we were going the right way or not. The road was awfully bumpy and there were several spurs that dead-ended at private farms. In the process of seeking out a closer look at this waterfall, we did get somewhat better views, but it just wasn’t as satisfying as we had hoped. 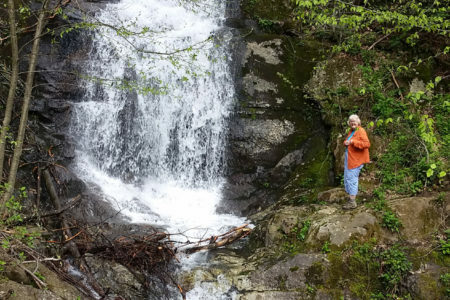 As we continued on the bumpy road, we then saw another waterfall. This one looked like it had a more satisfying rectangular shape in the distance. 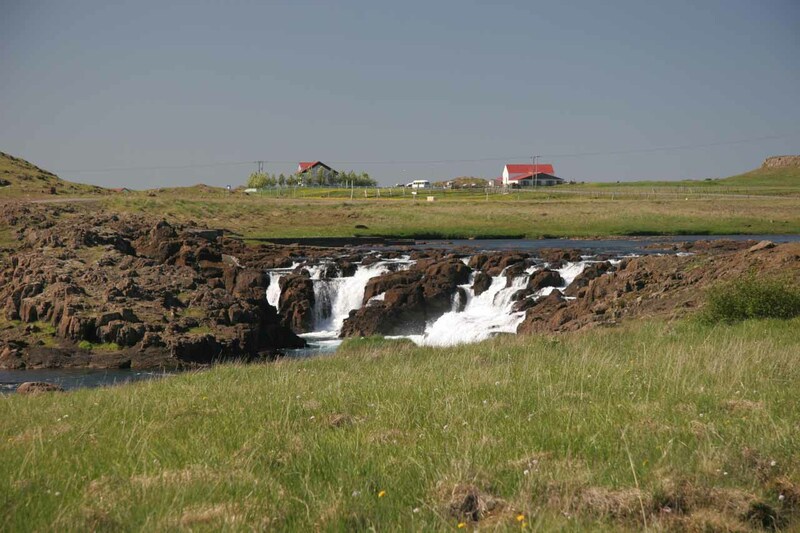 Like with Kerlingarfoss, we looked for a closer look at this one as well, but all we could get to was another private farm. 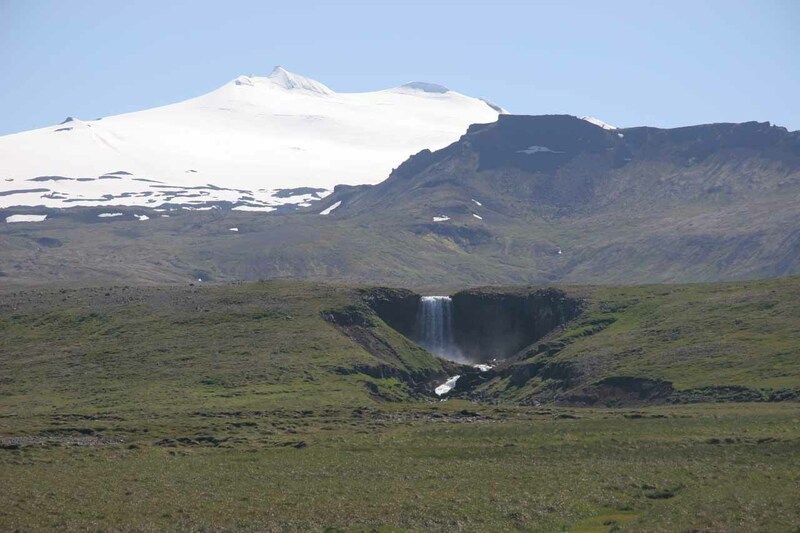 However, at least this waterfall allowed us to photograph it with the Snæfellsjökull glacier right behind it. Even though the waterfall itself was quite distant and in shadow, it was cool to see the glacier. I wondered in hindsight whether it was one that we were supposed to walk to in order to get closer since vehicular access didn’t seem to be possible. There certainly weren’t any signs that guided the way so we figured we had had enough of chasing this waterfall around and went right back to the main road. 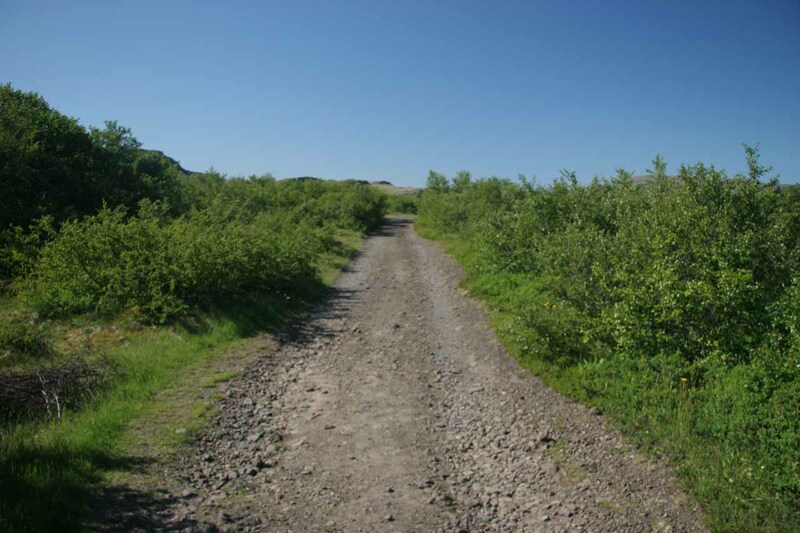 When we left this diversion, we continued heading west on road 574 towards the town of Hellissandur. 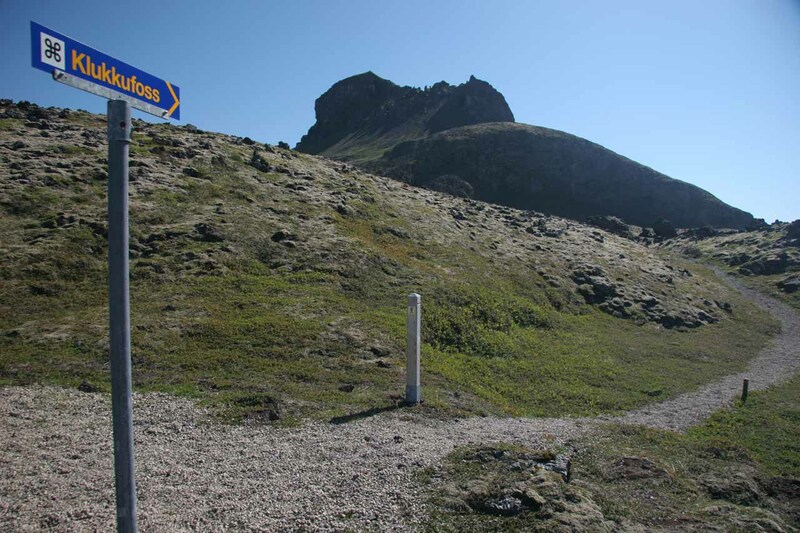 That was when we saw a signpost for Svöðufoss, which ended up taking us back to the exact same spot we took our initial photos from. 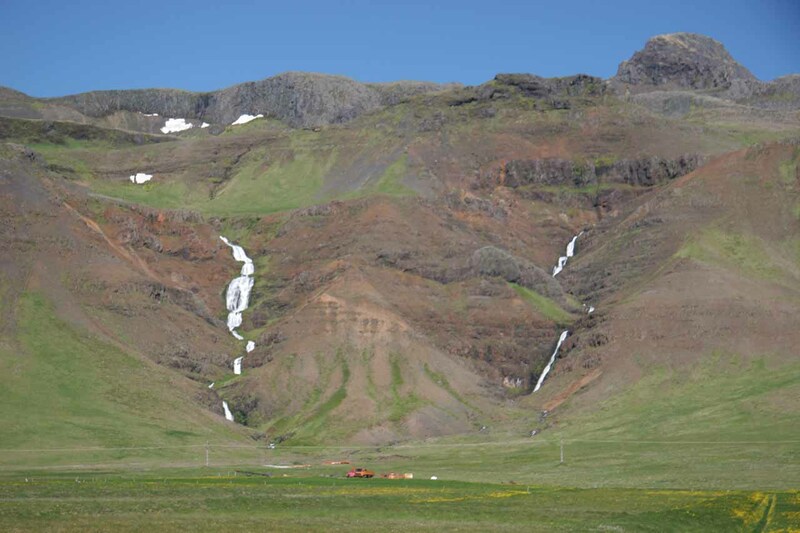 So I presume that that waterfall we had been chasing was called Svöðufoss. 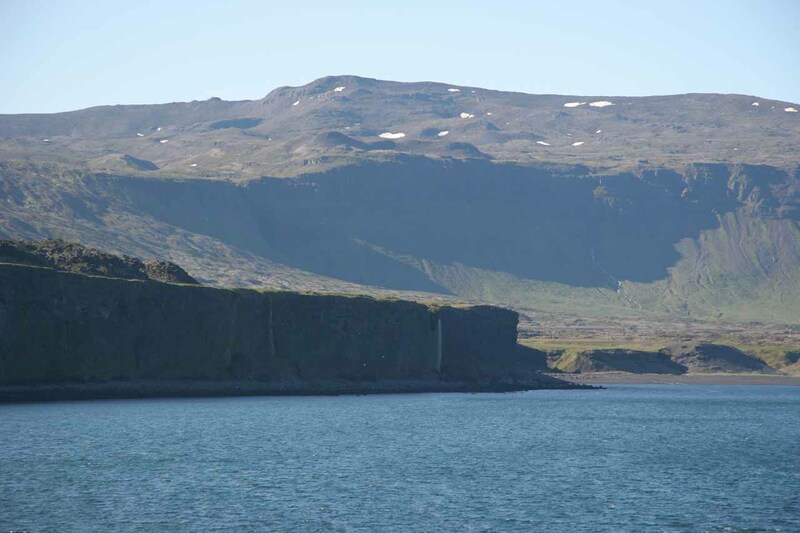 We didn’t spend much time in Hellissandur and next drove towards the western slopes of the peninsula. It was almost like a miniature version of New Zealand’s Mt Taranaki and its so-called Surf Coast (at least in a geographical sense). But in this instance, we weren’t going around a conical mountain like Mt Taranki in New Zealand. 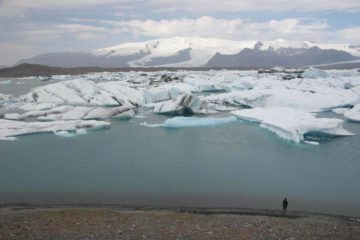 Instead, we were going around a glacier draped all over what appeared to be an old volcano. 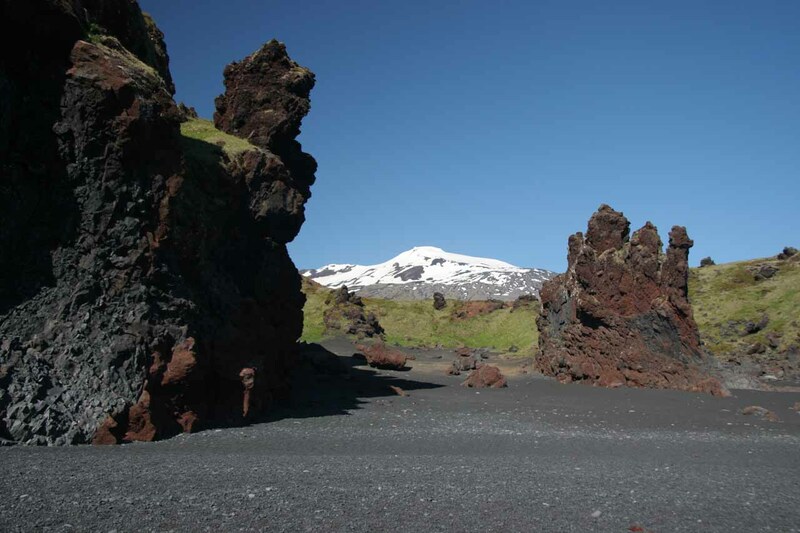 And surrounding this mountain was a series of black-sand coastlines with some pockets of dramatic cliffs. 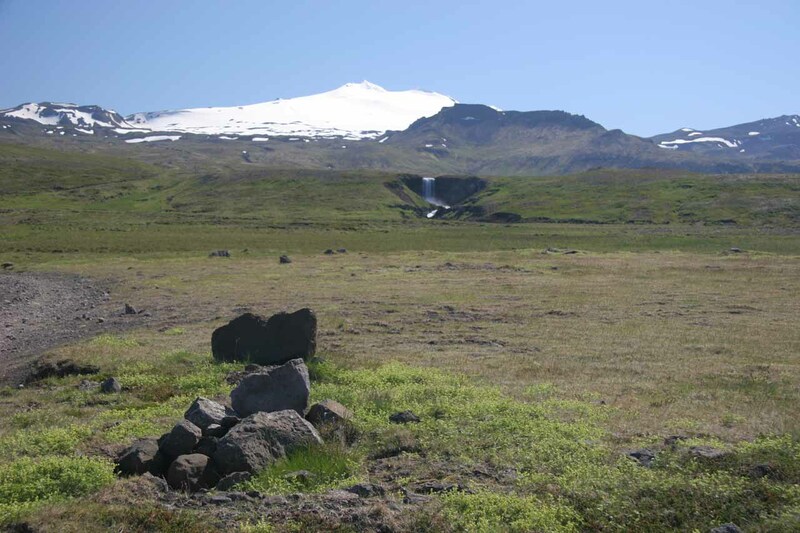 Eventually, we drove onto a rough unsealed road branching off the road 574 and climbing the western slopes of the volcano capped by Snæfellsjókull. 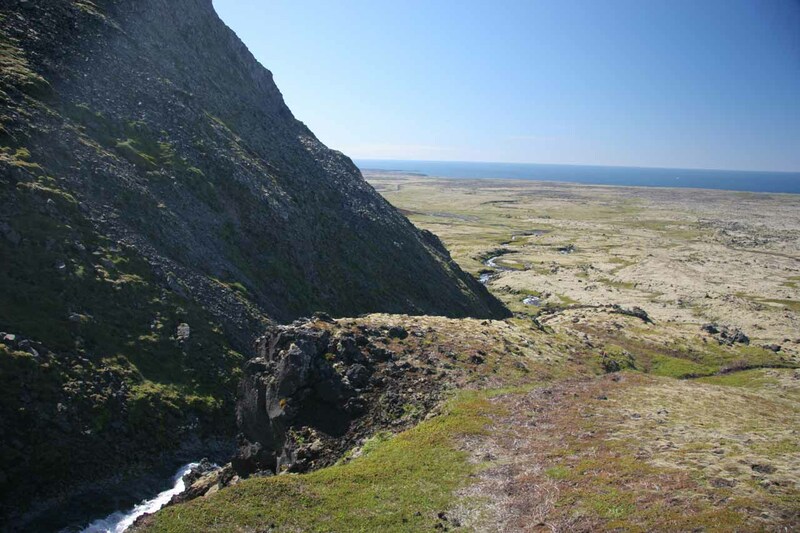 We arrived at the short pullouts for the signposted Klukkufoss at just before 4pm. After a brief walk in the cloudless skies, I was able to photograph the falls but it really didn’t look all that impressive compared to the ones we’ve seen earlier on the trip so far. 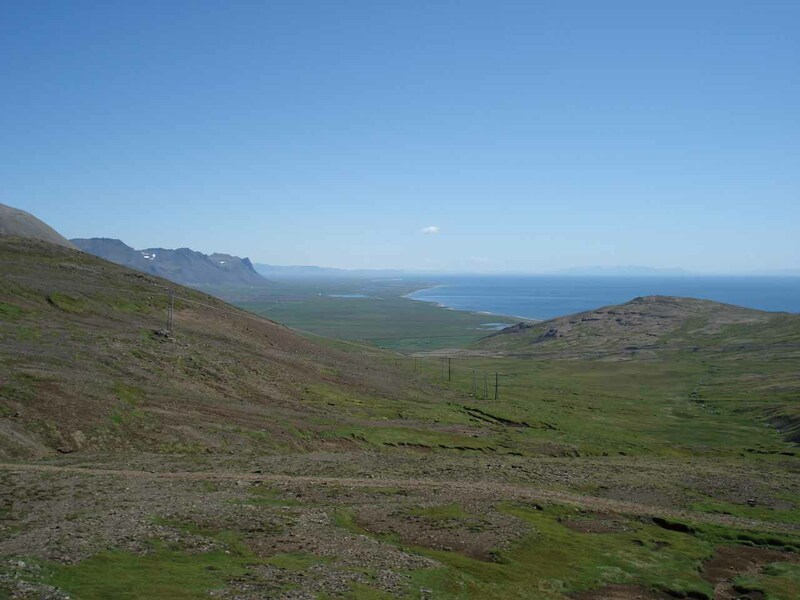 On the way back to the parked car, I was enjoying the nice panoramas of the ocean along with some long expanses of just grasslands and low-lying shrubs. 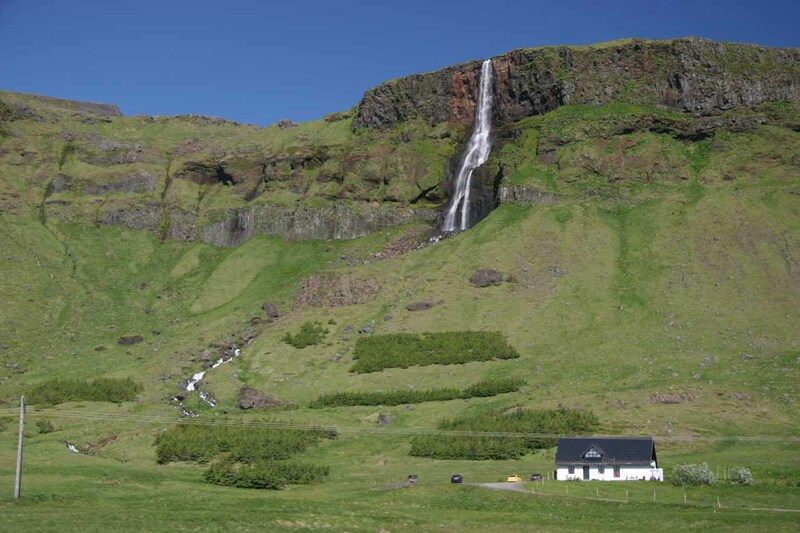 Indeed, Iceland seemed like a somewhat undeveloped place where Nature ruled more than societies. By 4:30pm, we continued south along the peninsula as it started to wind its way to the east. By now, the road started to turn a bit bumpy and unsealed though perfectly doable by 2wd vehicles. It almost appeared like this area would be completely sealed in time, but we happened to catch it while road construction was still going on. 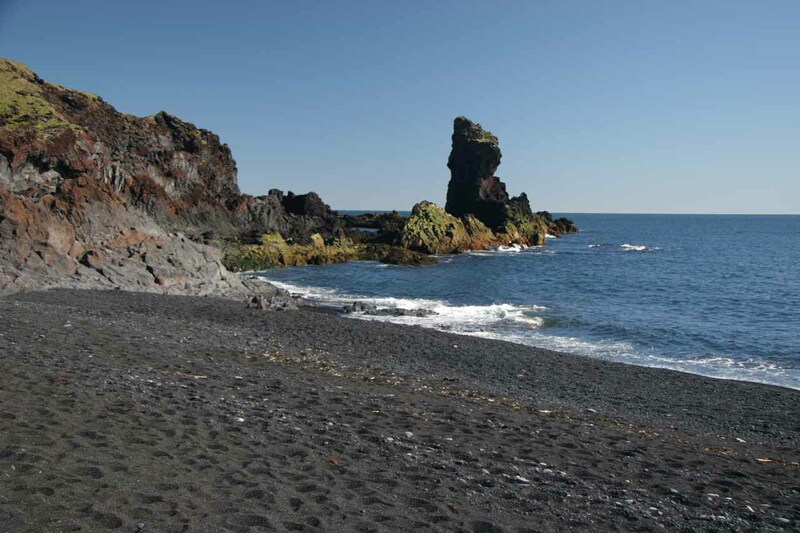 At around 4:45pm, we made it to a seemingly popular place called Djúpalónssandur. 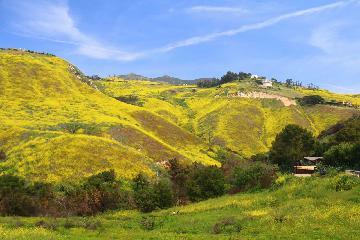 It was basically a kind of beach or coastal area with both scenic and historical qualities. The historical aspect came from a shipwreck that took place here. 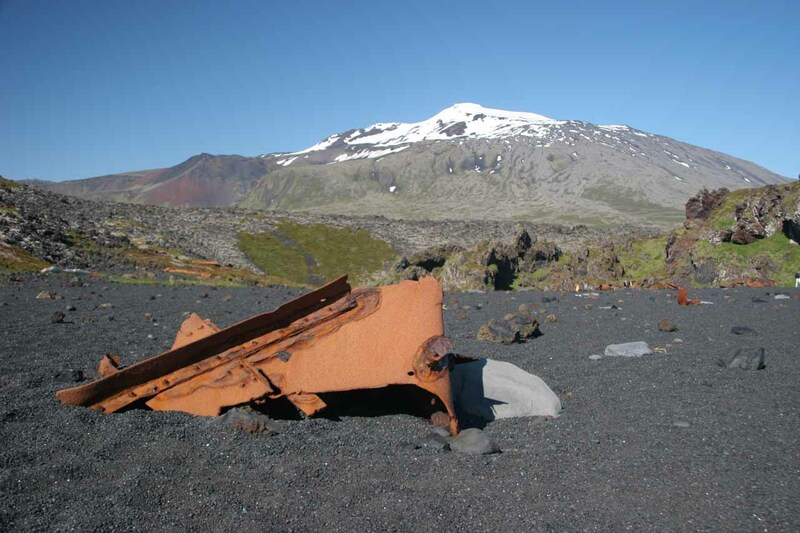 Some of the rusted remains were still lying on the sandy part of the coast. 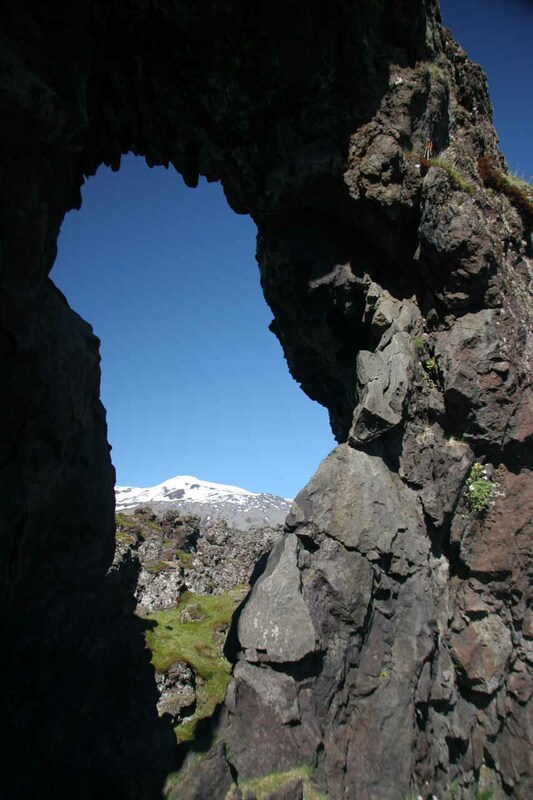 I had a pretty good time photographing Snæfellsjókull through a natural arch as well as getting a kick out of the four lifting stones of varying progressively bigger sizes and heavier mass. 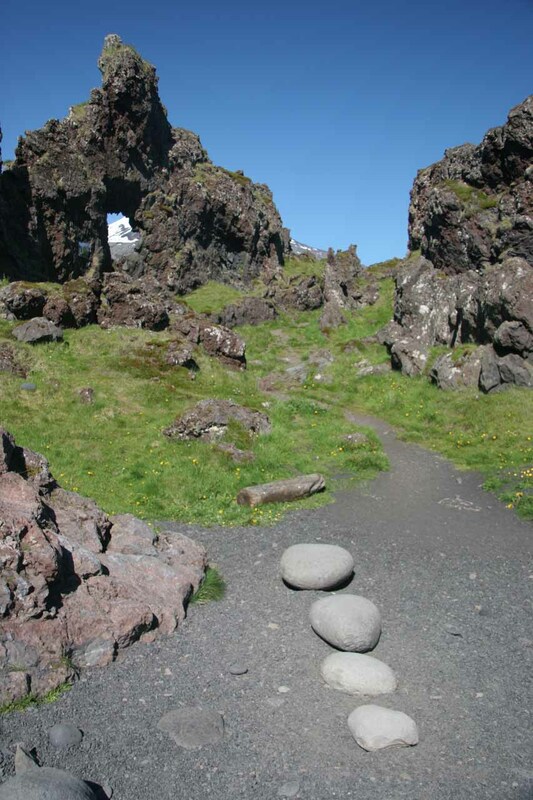 Apparently, there was a saga pertaining to these stones (having to do with trolls or something). Personally, I lifted a couple of these, but I passed on the last one due to the potential for back problems. Another interesting thing here was that apparently someone was showing off his photography or art gallery as he posted them on the formations around here. That was rather an interesting way to show people your work without actually being out there and exposing your work to the elements. It was a kind of advertisement graffiti, if you will. I don’t think I’ve ever seen anyone turn a natural attraction into an art gallery, but hey, why not if no one made it illegal and it shows off your work, right? There were still more trails leading to some named places that I really had no clue about. I wasn’t sure if they were attractions or towns. And given that we still had to swing all the way around the glacier and back to town, we couldn’t take the chance of getting caught up on more hours of exploring (though the weather and the scenery made it difficult to pass up). 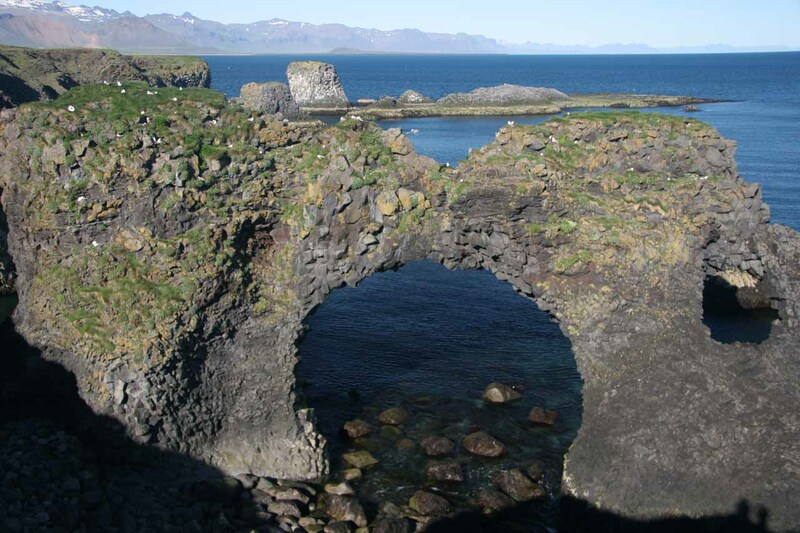 By 6pm, Julie and I finally checked out the hamlet of Arnarstapi, which was home to a collection of impressive sea arches. Although the waters remained calm this time of year, you had to look down precariously at all of these arches. Better to leave the birds to nest and fly around the area rather than humans attempting to get closer to the cliffs’ edges. We had pretty much a field day photographing these arches as they were all very tall. We didn’t bother trying to climb on top of these arches as I’m sure they’re not very stable. 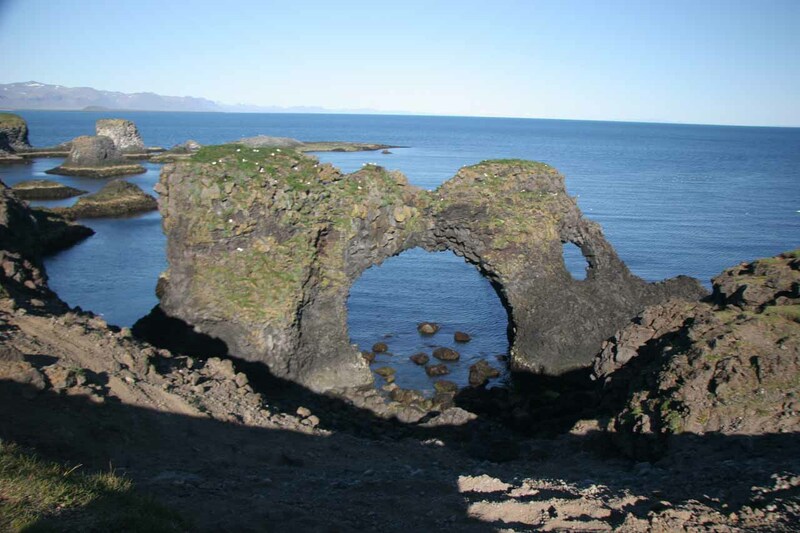 When we finally got to the last arch sighting, we laid our eyes on the the familiar-looking one (actually a multitude of them) seen in brochures as they pertained to Arnarstapi. Although getting to the bottom of the facing cliff to get a better look seemed doable, Julie and I figured it wasn’t the risk. So we settled for just looking through the arch with the body of water in the background through its span instead of the sky. 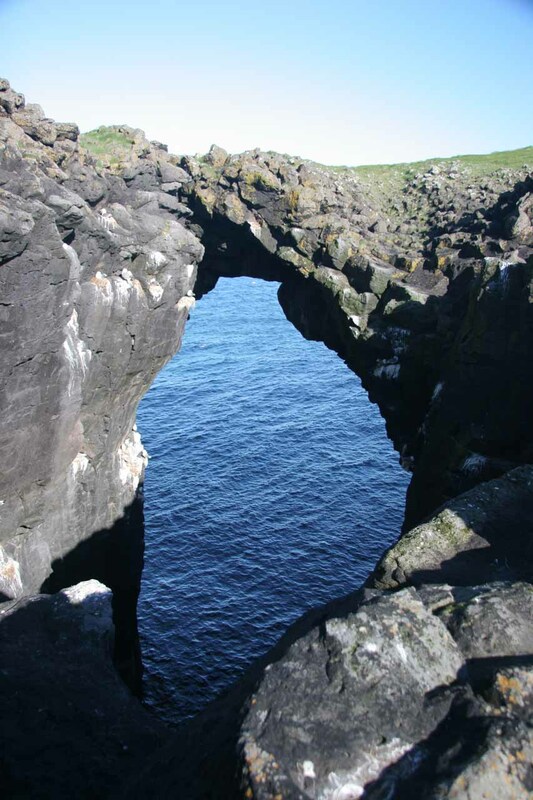 There also seemed to be smaller companion arches on the same sea stack containing this arch. So that added to the intrigue a little bit and kept us at this arch for longer than the other two. 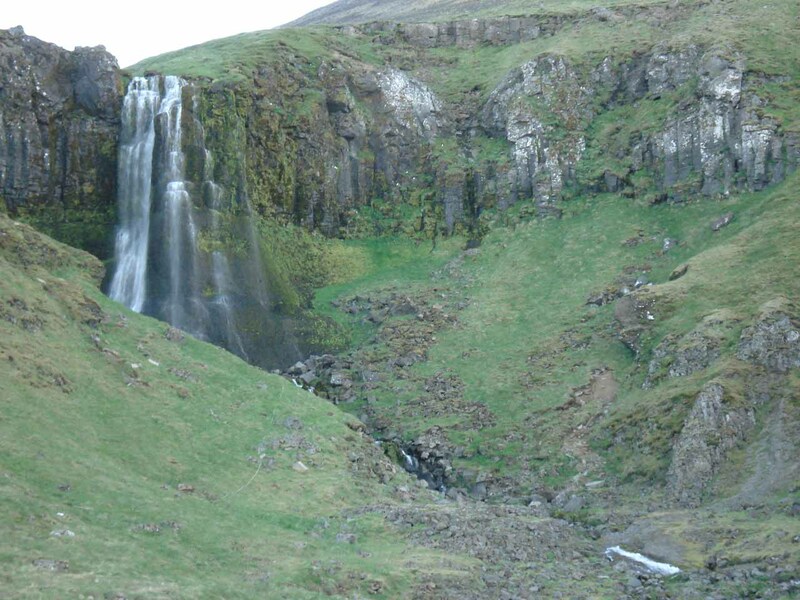 Another surprise in the Arnarstapi area revealed that there were waterfalls plunging over some cliffs and directly into the ocean. Too bad we wanted to get back to our hotel in time to shower and then look for dinner or else we could’ve tried to explore a little more to find a way closer to those cool cliff-to-sea waterfalls. After having our fill of Arnarstapi, it was time to head back to the car. 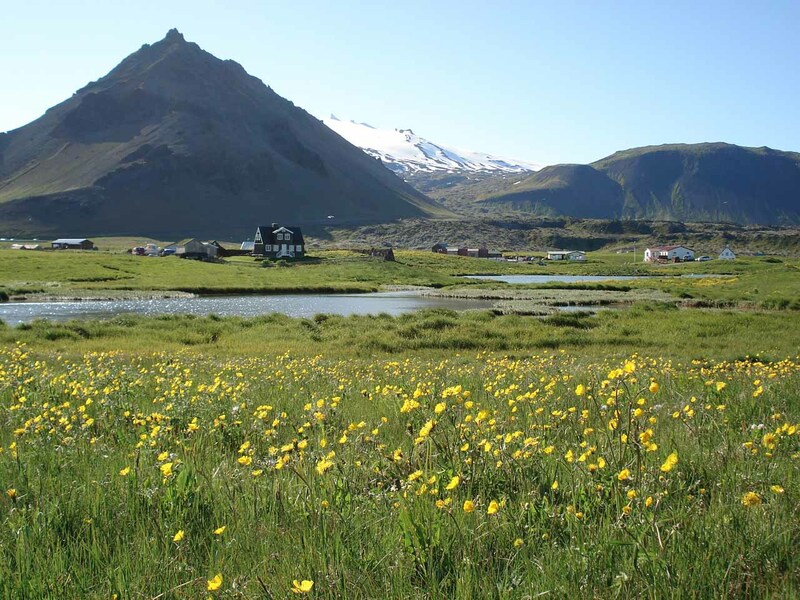 En route, we noticed there were more blooming wildflowers fronting some small tarns or watercourses with a hint of the Snæfellsjökull glacier in the distance. 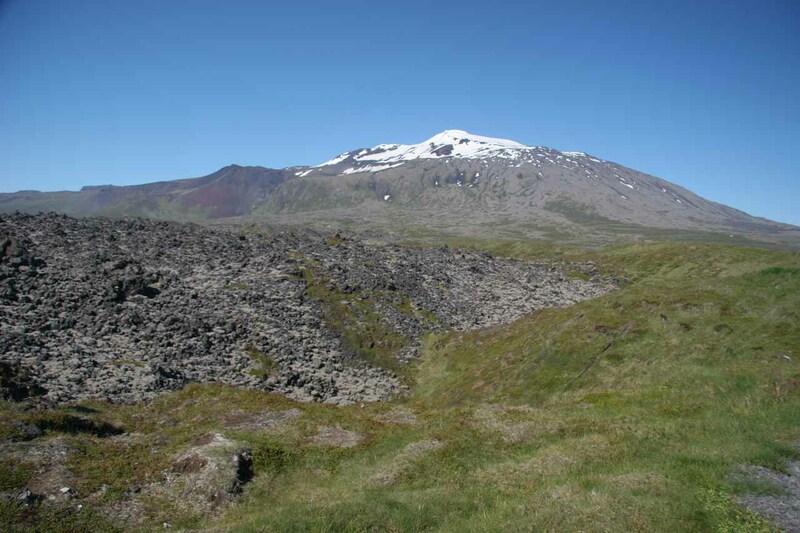 So we finished off the circular loop going around the glacier Snæfellsjökull. 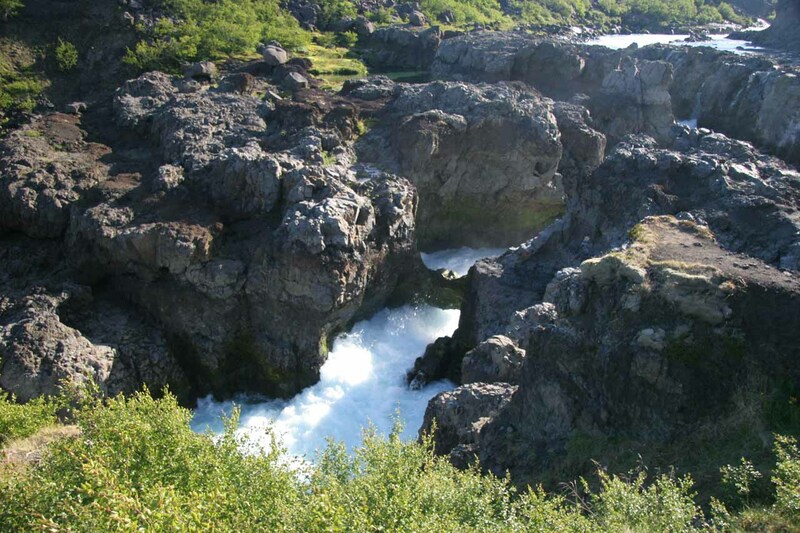 We passed by Bjarnafoss once again though this time there were shadows all over the cliff it plunge across. 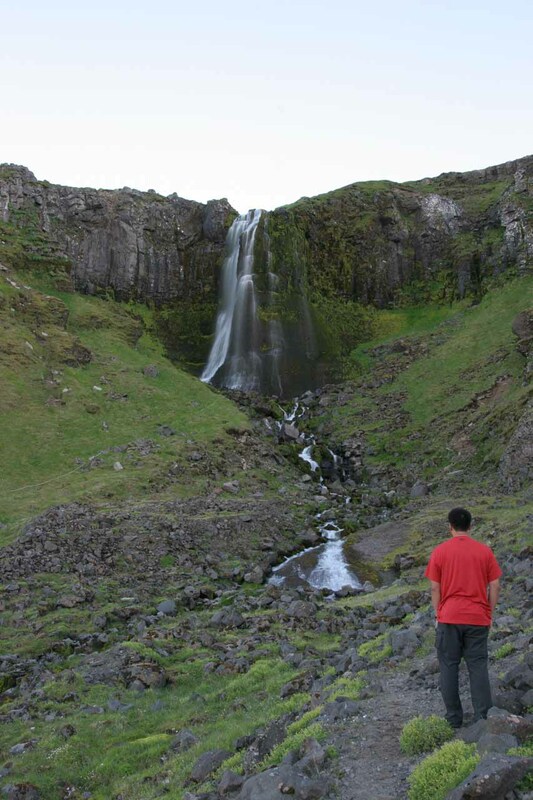 At a little over 7:30pm, we’d eventually get to a nice waterfall just east of Ólafsvík. It was nice to photograph as the shadows helped to lessen the overall brightness of the scene. Not much was known about this waterfall so we just took photos of it and then kept going. We’d eventually get back to town another 15 minutes later and decided to have some pizza across the street after the dinner menus looked awfully expensive (for a buffet no less). Although it was still quite bright outside and the sun was clearly way above the horizon, the town was quite dead. We tried to walk off the food we ate by walking to the falls in the back of town called Bæjarfoss. The charming falls was a great way to end off a day of tour beneath the still cloudless skies. It was still bright enough for us to think it was 4pm, but it was 10:15pm by now. Although the walk was short, there didn’t seem to be much signage to help us find the path to get us closer. So we ended up walking through some seemingly residential areas until we noticed some footpaths (still unsigned) along the watercourse coming from the waterfall. The whole falls was in the long shadows of the evening, and when we had our fill of the falls, we looked back towards town seeing how much of it was still under the light of the day even though it was almost 11pm by now. Once we had our fill of the falls, we headed back to the hotel. Even though it was still quite bright outside, we had a feeling that we were going to have a midnight sun even though technically it might sink briefly below the horizon sometime shortly after midnight. 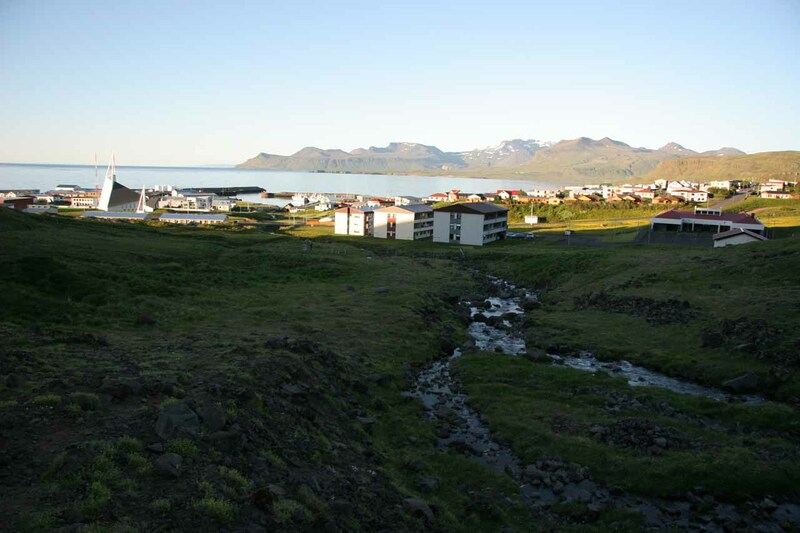 I had entertained the notion of doing the guided midnight walk on the Snæfellsjókull Glacier or at least witnessing the midnight sun from town. 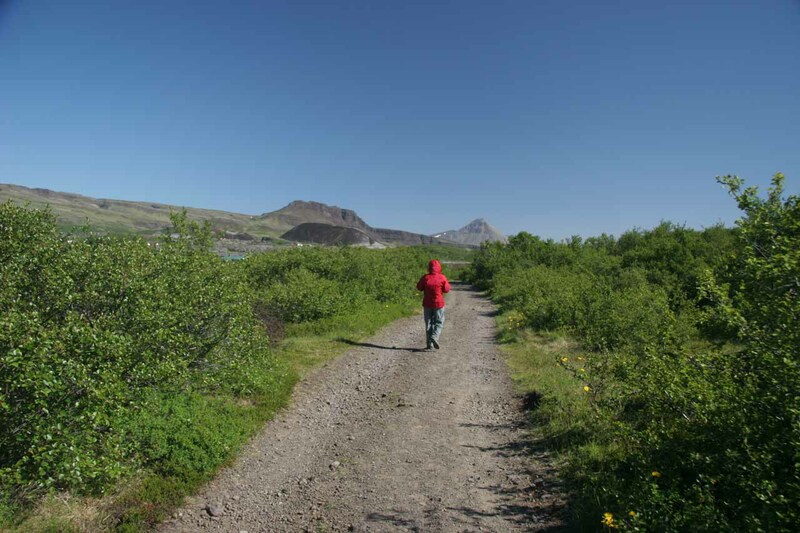 But we knew that tomorrow we had to drive at least an hour to get to our morning ferry which would leave for the Westfjords and that didn’t leave us much time to sleep in or risk oversleeping. So under such conditions, we tidied up and went time to sleep with our eye patches on to keep the light out.